community meetings | Park View, D.C. 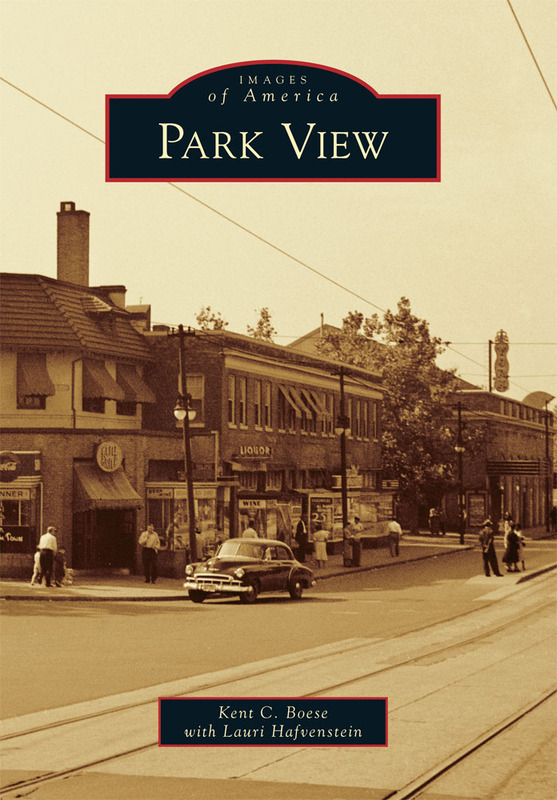 The September 6th Park View UNC meeting promises to be well worth attending. Below is the meeting announcement from the Park View listserv. Please join the Park View United Neighborhood Coalition for our monthly meeting next Wednesday, September 6 from 7-8pm at the Park View Rec Center. The main topic of our meeting will be vacant properties. We are honored to be joined by City Councilmember Elissa Silverman, who has championed a number of bills in recent years to address vacant property issues in the District. She will brief us on the problems that led her to work on this issue in the Council, and we’ll discuss how we can address vacant property issues in Park View. We will also be joined by representatives from MPD to provide a monthly update on police activity in the neighborhood. We’ll also hear an update on the recent meeting of the UNC’s new Public Safety Working Group and the latest on the upcoming neighborhood block party. If you are interested in public safety, consider joining the Luray-Warder Neighborhood Association meeting this Saturday, July 15th! This is their annual public safety meeting and their guest will be MPD’s Third District Commander Stuart Emerman. The meeting will be held at the Park View Recreation Center and begin at 11 a.m. 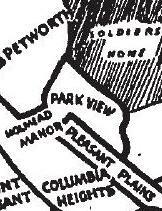 Please keep in mind that the border between the Third and Fourth Police Districts is Park Road, with the Third District area south of Park Road. Last night, NBC4’s Tom Sherwood moderated a panel discussion at Busboys and Poets (14th Street) organized by the Ward 1 Democrats on the District’s new Paid Family Leave Act. The legislation was approved in December and Mayor Bowser has until 5:30 pm February 16th to act on the bill. While many are of the opinion that she will not veto the bill, there is a possibility that she may allow it to move forward without her signature. After February 16th, Congress has a 30 day passive review process. If they take no action, the bill becomes law. 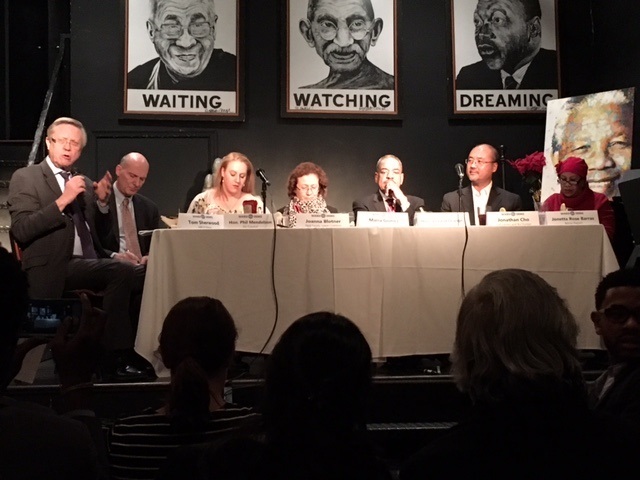 The panel consisted of Phil Mendelson (DC Council Chair), Joanna Blotner (Jews United for Justice), Maria Gomez (Mary’s Center), Vincent Orange (DC Chamber of Commerce), Jonathan Cho (Sakuramen and Bul Korean), and Jonetta Rose Barras (Barras Report). Mendelson, Blotner, and Gomez spoke in support of the legislation, and Orange, Cho, and Barras were critics of the legislation. Mendelson opened the discussion by stating that the goal of the Act was to help local businesses by making employment in the District of Columbia attractive and competitive to employees. Even so, implementation will not take effect until 2020 as money can’t be collected for the program until an agency is set up to administer the Act. Those opposed to the Act stated they were not opposed to universal paid leave, but rather how the leave was being funded. As enrolled, the funds to support the program are raised in the form of a tax paid for by District businesses. Cho stated that the money should come from employees in the form of a payroll deduction and be administered as an insurance program as other cities and countries are currently doing this. Barras was critical that residents from Maryland and Virginia who work in the District will benefit and that the Act excludes Federal and District of Columbia employees. Orange stated that he preferred a mandate that employers provide leave when needed by employees. Blotner stated that mandates don’t work and expressed support to increase the leave from 8 weeks to a longer period in the future. Gomez acknowledged that the Act will have a significant cost to Mary’s Center, but that providing universal paid leave to take care of District families is the right thing to do. Mendelson did acknowledge that he would have preferred the structure described by Cho (payroll deductions), but that the District’s unique relationship with Congress and the Home Rule Act prohibits payroll deductions — an issue that has frustrated the Council for many years. Overall, I left the discussion with the impression that the Act will be implemented and the city will move forward to set up the agency in support of the program … but that the Act can also be amended to make the legislation and program better. 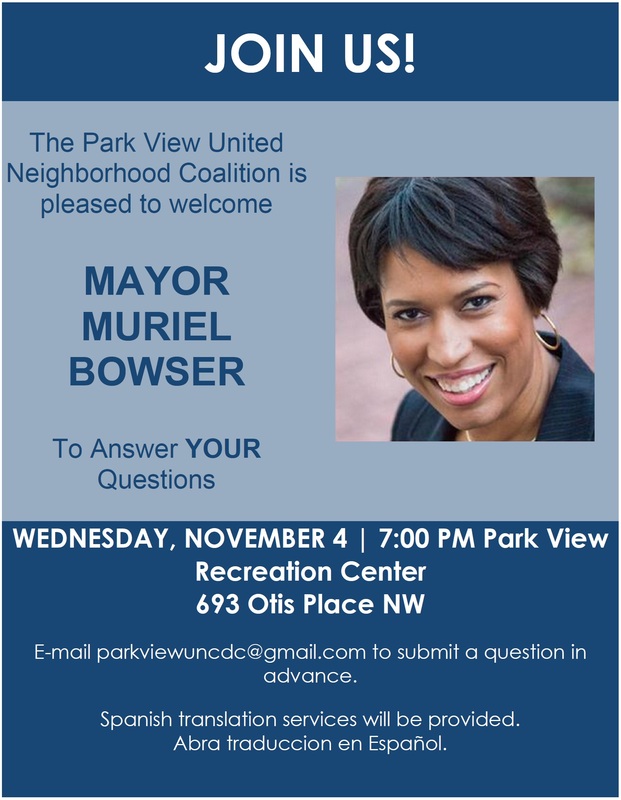 According to announcements on area listservs and community meetings, Mayor Bowser is scheduled to come to the Park View United Neighborhood Coalition meeting this Wednesday, November 4th, at 7 pm (see flyer to the right and annoucement below). Questions are being requested in advance and I’m sure there will be many. For me, my hope is that Mayor Bowser will provide answers to questions related to two key developments in the area. The first is the redevelopment of the old Hebrew Home at 1125 Spring Road. This property consumed a significant amount of community engagement from June 2014 to the end of the year. Yet, few to no details have been shared since the beginning of 2015. The second area I hope Mayor Bowser will spend some time on are details related to the Park Morton redevelopment. The redevelopment of Park Morton will be truly transformative for the entire Park View community. However, news that this project would include a portion of the Bruce Monroe parcel was greeted by both support and opposition in the community. The meeting on Wednesday would be a great opportunity for the Mayor to speak to this issue. The Park View United Neighborhood Coalition is excited to announce that Mayor Muriel Bowser will be attending our next meeting next Wednesday, November 4th at 7 PM at the Park View Recreation Center (693 Otis Place NW). This will be a great opportunity to ask the mayor about issues that affect Park View and the entire city! In order to let the mayor answer as many questions as possible during the forum, we are asking neighbors to submit their questions in advance. To submit a question please send an email to parkviewuncdc (at) gmail.com with the subject line Question for the Mayor. Questions may be anonymous or not, that is up to you. Also, we will accept written questions at the meeting. Spanish language translation services will be provided. 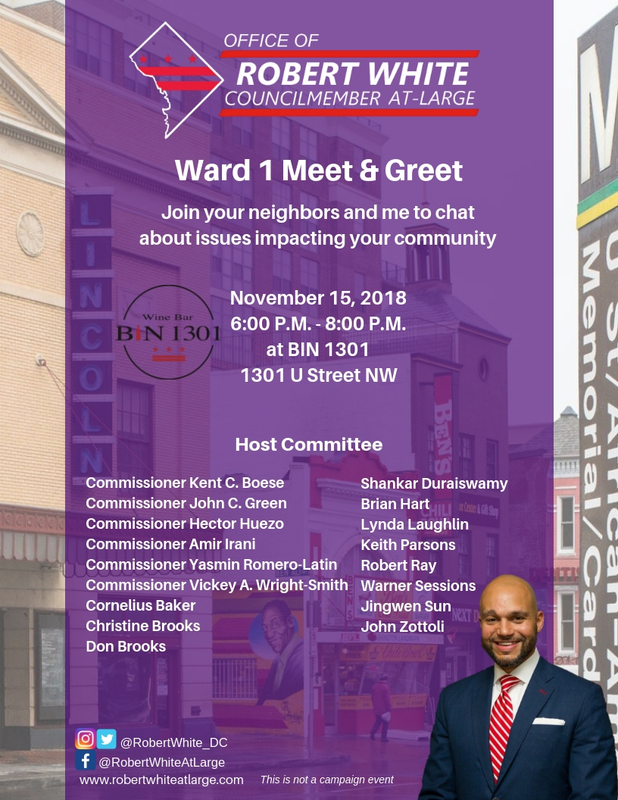 COME OUT, GET ANSWERS AND SHOW THE MAYOR THAT PARK VIEW IS ENGAGED IN MAKING A BETTER DC!